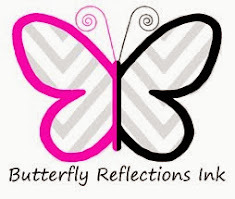 Hi there and welcome to Butterfly Reflections Ink! I'm loving the bright, happy colors on this fun card! 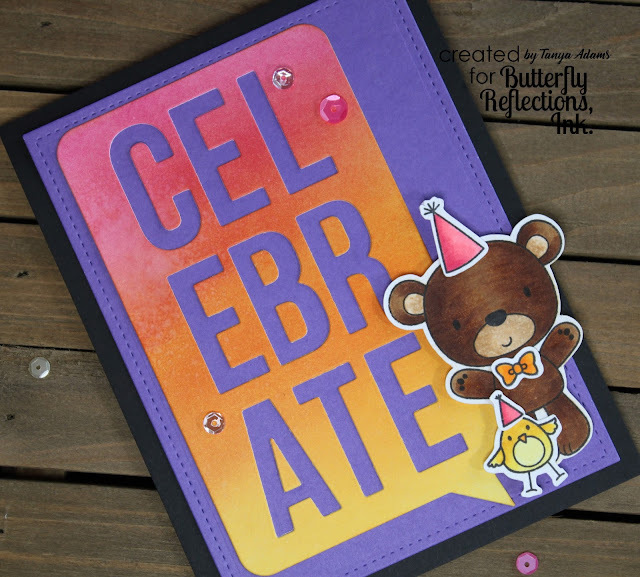 I created the "Celebrate" background with the fabulous Celebrate Speech Bubble Die from My Favorite Things. Before die cutting the bubble, I inked up some white card stock with Distress Inks in the following colors: Picked Raspberry, Spiced Marmalade and Squeezed Lemonade. While my inked up panel was drying, I colored these cute little guys from the My Favorite Things stamp set, Furever Friends. I added birthday hats and the bow tie from the MFT stamp sets, Happy Hippos and Beary Special Birthday. I popped up my fun little birthday buddies on the front of my card with a bit of Scotch Foam Tape. And, as a finishing touch, I adhered a few sequins from the Pink Lemonade Mix by Neat & Tangled with some Ranger Multi Medium Matte. Thank you for stopping by today. I hope you have a great day and I'll see you again next Tuesday! Beautiful job with the distress inks... those are my fav. colors as well! The Bear & Bird are ADORABLE!! Super Sweet card!